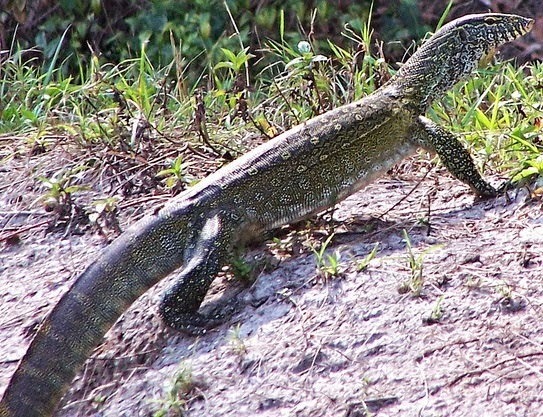 The Florida Fish and Wildlife Conservation Commission is increasing its efforts to locate and remove Nile monitor lizards that can grow to over 5 feet long and weigh close to 15 pounds. The lizards, which are native to Africa, have been found in Palm Beach County, Florida. The monitors are known in their native Africa to prey or scavenge for a variety of small animals, including domestic cats. In Florida, Nile monitors could impact populations of nesting birds (especially burrowing owls), gopher tortoises, nesting sea turtles, nesting American crocodiles, and other species listed as threatened or endangered. The lizards are semi-aquatic and can be seen basking or foraging near bodies of water. FWC officials are surveying canals in Palm Beach County and distributing fliers requesting the public’s assistance in locating these animals because biologists expect that these lizards will be breeding soon and may be more visible this time of year. However, FWC cautions that members of the public should not to attempt to capture a Nile monitor themselves. Monitors are not innately aggressive but like any wild animal they may defend themselves if aggravated or threatened. Instead, FWC asks that the public take a picture of a suspected Nile monitor and immediately report it online to IveGot1.org or by phone at 888-Ive-Got1 (888-483-4681). The monitor's body color can range from a light yellow to dark olive or brown. They have a pattern of light yellow markings on the back, which appear as bands or stripes closer to the head and tail. FWC says that other lizards can easily be mistaken for Nile monitors, including green iguanas, spiny-tailed iguanas, curly-tailed lizards and more. “Color and pattern variation is pretty common, so the most effective way to verify the species is to take a picture of the animal and submit it along with a report of your observation,” said Eckles.